Great God of Deliverance, thank you for saving Israel from Pharaoh's grasp, David from the sword of Goliath, and Daniel from the lion's den. But O Heavenly Father, thank you most of all for the victory of Jesus over sin at Calvary and his victory over death at the empty tomb. We long to see you face to face and thank you for our freedom. Until that day, guide us as we use this gift of liberation to serve you children and live for you. In Infant Jesus' name we pray. Amen. 38John said to him, "Teacher, we saw a man casting out demons in your name, and we forbade him, because he was not following us." 39 But Jesus said, "Do not forbid him; for no one who does a mighty work in my name will be able soon after to speak evil of me. 40 For he that is not against us is for us. The Holy Spirit purifies our heart and frees us from our chaotic passions, such as envy, jealously, greed, and resentment. God's love is a generous and selfless love which is completely oriented towards our good. The love that God places in our hearts seeks the maximum good of our neighbor. God's love purifies and frees us from all jealousy and jealousy – and it compels us to give bigheartedly, especially to those who lack what they need. Everyone in need has a claim on us because they are dear to God who created them in his own image and similarity. God created us in love for love. 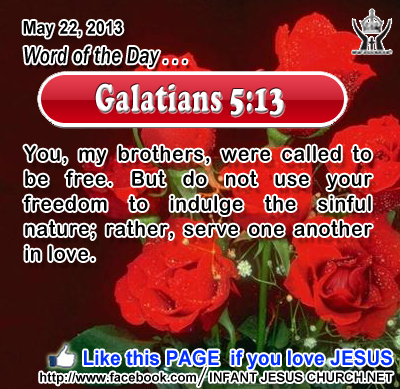 We are most free and happy when we love as he loves. The love and generous help we show to our neighbor also expresses the gratitude we have for the abundant mercy and compassion of God towards us. Jesus declared that any kindness shown and any help given to those in need would not lose its payment. Jesus never refused to give to anyone in need who asked for his help. As his disciples we are called to be kind and kind as he is. Are we thankful for God’s mercy and kindness towards you and are we ready to show that same compassion and liberality towards your neighbor?